Visitors will surely be fascinated by the two or three hundred year old buildings, sights and statues of the Baroque inner city. However, it is true that not only the visitors are charmed, but the residents of the city also. No matter how many times they have already seen it they also like walking on the streets and sitting in the pavement cafés watching the crowds of amazed tourists. The city can be proud of a number of sights. In addition more and more famous historians pose the question whether the former coronation city, Fehérvár was really here. It is believed that the ancient Fehérvár was actually northward from the capital, in the area of Pilis. Those who would like to get an insight into this riddle can easily inquire about it, as more and more books study this question. In 972, during the rein of Géza, a stone castle with a palace and church were built here. At Christmas in 1000 the first Hungarian king, Saint Stephen was crowned here. He located his seat in the city and also built a huge cathedral, and so the construction of the city started In the Middle Ages the city expanded steadily, and because of the marshy character of the area the outskirts extended into the neighbouring hills. 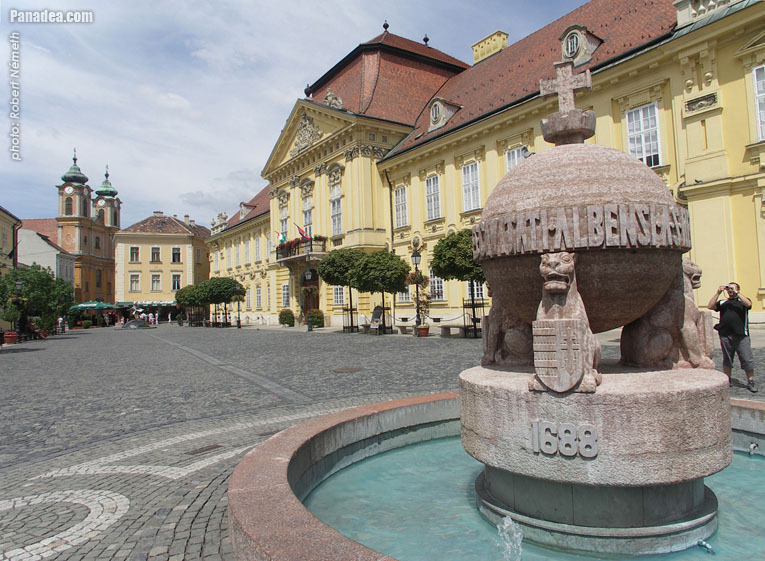 In 1222 Andrew II published the Golden Bull in Székesfehérvár, it was the first official constitution of the country. In 1242 the Tartars attacked the city, but they were not able to seize it. Due to the fact that the marshes filled up with water after the summer rains, they were prevented from reaching the hills. Unfortunately the Turkish expansion did not avoid the city and they managed to capture it in 1543 and held it until 1688 (with the exception of the year 1601). At these times most of its population left the city and the buildings started to deteriorate. The Hungarians and Raci population (Serbs) started to resettle at the beginning of the 18th century. Furthermore German and Moravians also appeared here. However the city could not retrieve the role of the capital as Pozsony became the place of parliaments and coronations. 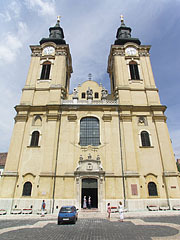 The cathedral was built by the first Hungarian king between 1003 and 1038, when he set up his seat in Székesfehérvár. The cathedral used to serve as the treasury, the archives and the place where the regalia were stored. Forty three kings were crowned here in medieval times and fifteen of them were buried here. Later the Turks took the treasures of the cathedral with them; they even melted its bells down and used the building as an armoury. Its walls were still standing in 1688 when the city was recaptured and Masses were again held in the chapel. In 1848 significant findings came to surface during the digging of a well in the garden of the Epsicopal Palace. The first finding was the red marble tomb of Béla III and his wife, Anna of Antiochia. The sarcophagus of St Stephen can also be seen here. The Ruin Garden is the exhibition area and storing place of the remains of the royal cathedral. Approaching the square from the direction of the Ruin Garden, the Episcopal Cathedral can be seen on the right side of the square. It was built on the ruins of the medieval Cathedral of Virgin Mary between 1780 and 1803. 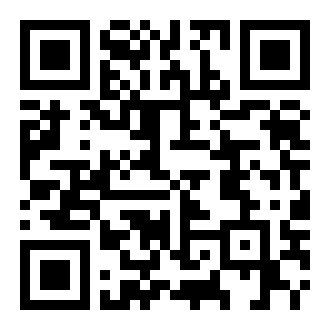 In its library of forty thousand volumes medieval codices and ancient printings can be found. 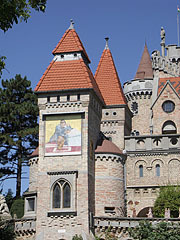 A Franciscan church and monastery now stands on the site of a former castle. Prince St Imre was born here. His statue is placed in the small gap between the church and the monastery. 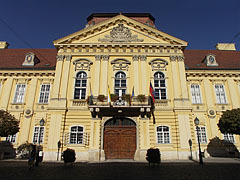 The 18th century City Hall is situated opposite the church. 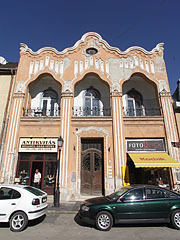 In the 1930s this Baroque building was connected to the Zichy palace in Zopf style with an access balcony. The ornamental gate of the City Hall is decorated with two Corinthian columns showing Justitia, the Goddess of Justice and Prudentia, the goddess of foresight. If you go along Liszt Ferenc Street in the direction of Piactér you will find yourself in front of the brass statue of Aunt Kati, the big-bottomed lady, who is carrying her goods to the market in her carriage. 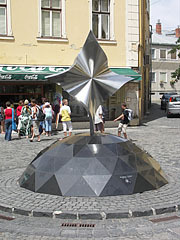 This statue symbolizes the typical figure of the former market. In its crypt the tomb of Béla III and his wife, Anna is exhibited. 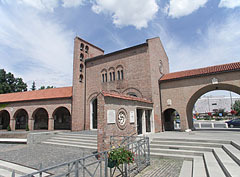 It was brought here after the excavation of the original cathedral. St Anna Chapel is located on the left side of the cathedral, it is a one-aisled church built in Gothic style around 1470. This is the only intact medieval building in the city; this may be due to the fact that the Turks used it as a house of prayer. The relic of the skull of St Stephen, the founder of the state, is exhibited in the Roman Catholic Episcopal Cathedral, which was built in the 18th century in Baroque style; this relic can be seen during the celebrations of 20th August as well. A gate opens from the square behind the Cathedral; it leads to the building of the automation clock. 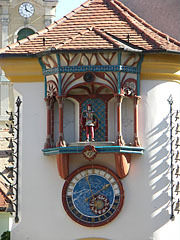 The figures of the clock are Hungarian historic persons, who appear at certain times with background music. 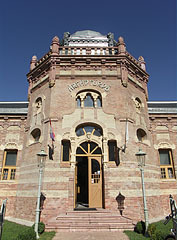 In a house on Rác Street, which was originally bought from its Serb owner, a museum is located. It displays the district and the ethnography of the Serbs. In the thatched house with whitewashed walls, the original furniture of the living room and kitchen are exhibited, together with the tools and documents of different crafts, like a furrier or wool cleaner.